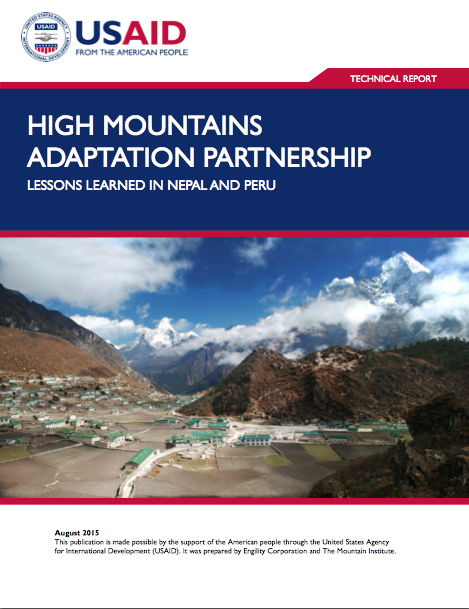 This report details the lessons learned during the implementation of the High Mountains Adaptation Partnership (HiMAP)(www.highmountains.org) project between March 2012 and June 2015. Located under the broader USAID Climate Change Resilient Development (CCRD) project, the goal of the HiMAP is to strengthen the climate change adaptation capacities of people who live in, or are dependent on, high mountain glacial watersheds and the ecosystem services which they provide. The document is intended to be a resource for USAID Missions, donors, practitioners, and NGOs interested in learning more about the challenges of working in remote and roadless high altitude regions, particularly in view of USAID’s growing portfolio of high mountain climate change adaptation, water management, biodiversity conservation, and livelihood improvement projects throughout the world. The lessons learned should also be of interest to those seeking to learn more about the new and emerging field of urban mountain development; highland-lowland interactive systems; and science-based, community-driven adaptation and community development projects. The lessons and insights were derived during the course of developing Local Adaptation Plans of Action (LAPAs), concurrent with glacial field studies designed to inform the LAPA process, in the Mt. Everest region of Nepal and Cordillera Blanca of Peru. The Khumbu LAPA was the result of extensive consultations, meetings, and workshops involving over 300 participants from a wide range of stakeholder groups over a two-year period. The resulting LAPA represents a major step in the ability of local people in the region to understand, evaluate, and adapt to the impacts of climate change on their high mountain environments and lifestyles. The Quillcay LAPA demonstrates the value of conducting careful consultations with both rural and urban stakeholders to make sure that analysis of climate threats aligns with local priorities, problem definition, and funding resources. Trust and formal memoranda of understanding (MOU) with local governments and stakeholders must be established prior to commencement of the LAPA consultations in order to maximize the potential for LAPA success, effectively mainstream identified priorities into available funding opportunities, and avoid misunderstandings or surprises regarding roles and responsibilities. The basic LAPA methodology should be tailored to local conditions and needs in geographically uniform regions, as opposed to political delineations. Development goals in the context of climate change should be incorporated into the LAPA process while building strategies to work with government for their implementation. Marginalized populations and the poor should be included in consultations since they are the most vulnerable to the impacts of climate change and have fewer options for alternative livelihoods. Complementary science-based climate change knowledge should be generated in support of the LAPA process and shared with communities, government agencies, and NGOs. Mainstreaming LAPA actions into existing government institutions, organizations, and funding opportunities from the beginning is critical to helping local communities deal with the effects of climate change in the long term by. Knowledge generated in the course of the LAPA and field science process should be shared in multiple forms (publications, videos) to enhance the building of local capacity as well as the capacities of other communities around the world facing similar threats. Challenges resulting from the remoteness of high mountain regions and local factors must be recognized and planned for at the beginning of the LAPA process. Despite the success in conducting community consultations and encouraging communities to think about and prepare for climate change, glacier-dominated areas around the world will continue to pose unique challenges to communities as they adapt to the impacts of global climate change—particularly the increasing threat of GLOFs (glacial lake outburst floods). Glaciated mountains are among the least studied environments in the world from a physical, social and climate change perspective, thus adaptation in these regions appears more complex and challenging than in other areas. Contemporary developments—such as the formation of thousands of new and, potentially, dangerous glacial lakes—are unprecedented in humankind’s experience of change and adaptation. Given the critical importance of high-mountain glaciated landscapes to the millions of inhabitants of cities and communities that live in or rely upon them, interdisciplinary climate change research approaches and applied field programs—such as those practiced by the HiMAP—that actively combine the social, physical and engineering science dimensions, will be required in order to achieve the best understanding of current and future climate-induced risks. USAID’s growing portfolio of projects in high mountain regions throughout the world is a promising indicator that these approaches are well underway. Alton C. Byers, Amanda D. Cuellar, Daene C. McKinney, Michael E. Cote (editor), Jonathan Cook (reviewer) (2015) HIGH MOUNTAIN ADAPTATION PARTNERSHIP. CASE STUDIES AND LESSONS LEARNED IN NEPAL AND PERU. June 2015. Prepared for: United States Agency for International Development Global Climate Change Office, Climate Change Resilient Development project Washington, DC. This report was produced under the USAID Climate Change Resilient Development (CCRD) project. Visit www.ccrdproject.com to learn more. More videos detailed on pages 51 and 52 of the report.